As motorcycle technology continues to progress, so too have motorcycle helmet communicators. We have Bluetooth ranges that continue to increase, voice prompts, group intercoms, mesh technology, apps, and more. It’s fair to say that two major players have dominated the Bluetooth helmet communicator game, for motorcycle helmets at least. Sena and Cardo have wide ranges of offerings for all sorts of applications, though they’re not the only ones out there. Considering all of the products currently on the market, we’ve put together a helmet communicators buyer’s guide to help you decide which units will work best for you. Evans Brasfield recently put the PackTalk Bold to the test and came away pleasantly surprised with how the system performed. Evans is our resident Bluetooth communicator specialist, having tested nearly all of the units to come out for at least the last 75 years. Evans’ full review of the Cardo PackTalk Bold gives a great in depth review of the system and what it’s like using it out in the streets. To summarize for this list’s purpose, some of the features that stood out as working well to my esteemed colleague were the Dynamic Mesh Communication (DMC), next-gen voice controls, and the overall audio quality. 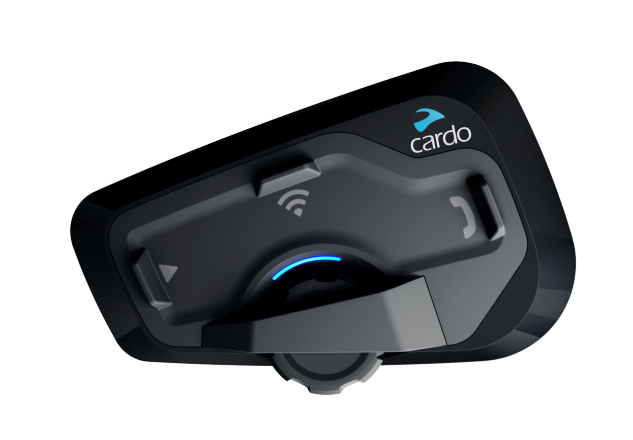 Cardo’s DMC technology has been around for a while now and has grown more and more popular with other manufacturers jumping on board. In both Evans’ and my tests, Cardo’s DMC technology works well and doesn’t drain battery life like other units. Cardo has also put an emphasis on voice controls, allowing riders to keep their hands firmly planted on those grips. Once you have Cardo’s specific idiosyncrasies memorized, using the voice commands becomes second nature when using the PackTalk Bold. Brasfield gave the PackTalk Bold the nod for having the best audio quality he had used in a Bluetooth headset. Cardo’s top three units: the PackTalk Bold, PackTalk Slim, and Freecom 4+ all now use JBL audio which we hope is even better than before. The Cardo Systems PackTalk Bold retails for $339.95. Cardo’s PackTalk Bold Bluetooth communicator is available from Amazon and other retailers. The Cardo PackTalk Slim has all of the features of its larger brother, yet is separated into two parts to keep the system slim on the side of your helmet. At the rear, the PackTalk Slim’s battery connects to the back of the helmet’s shell while the slim control module connects in the normal position on the side. 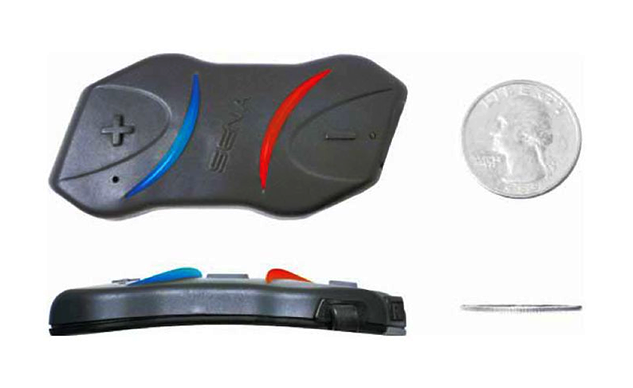 With the supplied mounting hardware, the Slim should be mostly universal across all helmet manufacturers. As with the Bold, the Slim can be used with the same laundry list of voice controls which means you’ll rarely need to take your hands off of the bars to use it. DMC technology, JBL audio, and all of the other features included on the Bold, are included on the Slim. The Cardo PackTalk Slim retails for $339.95. 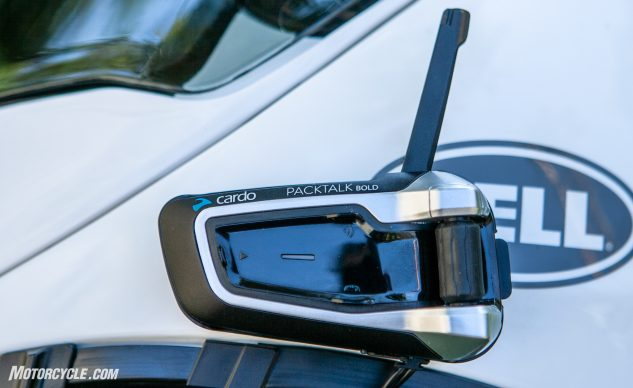 Cardo’s PackTalk Slim Bluetooth communicator is available from Amazon and other retailers. Cardo Systems’ new Freecom 4+ joins its Freecom line at the head of the pack, offering premium features at a mid-level price point. The Freecom 4+ uses JBL audio components, like the PackTalk systems, which should deliver great sound quality considering the systems we have used previously have worked very well. The overall package of the Freecom 4+ is compact and well designed for use with gloves. Key features of the Freecom 4+ are its universal connectivity to other brands, audio sharing to listen to the same music with a passenger, call to intercom which allows merging of phone calls into intercom conversations, as well as the ability to charge the unit while you ride, among other standard features. The Cardo Systems Freecom 4+ retails for $249.95. Cardo’s Freecom 4+ Bluetooth communicator is available from Revzilla and other retailers. 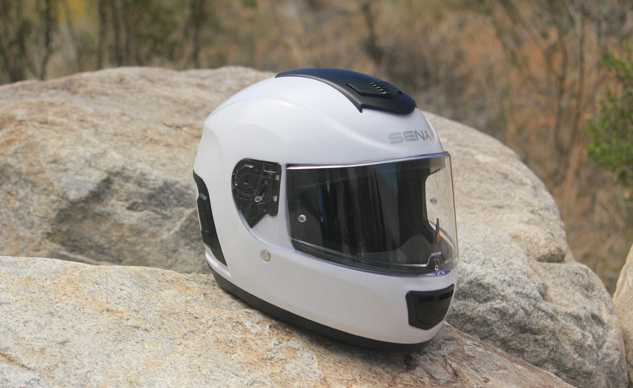 The Sena 30K is the brand’s top-o-the-line Bluetooth communicator designed for motorcycle helmets. The 30K takes all of the features from the 20S and crams them into a newer, blacker package with the addition of Sena’s new Mesh Intercom technology. Sena’s mesh network allows you to connect with up to 16 other riders in Private mode, which allows riders to come in and out of the network based on distance without disconnecting other riders. 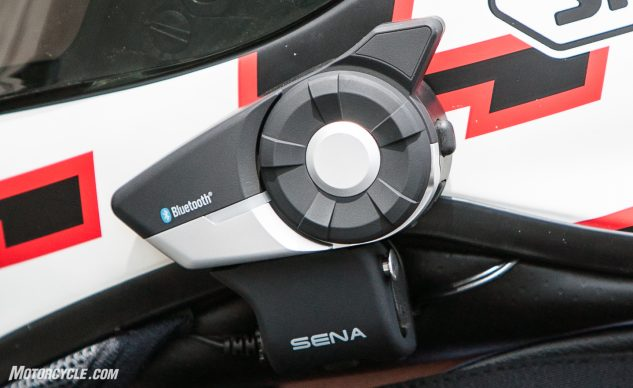 Sena isn’t the first to use this technology but we were happy to see it included on the new 30K headset. The 30K uses Bluetooth 4.1 technology, allows audio multitasking such as listening to music and chatting, voice commands, intercom, and its advanced noise control also reduces the effects of ambient noise on conversations. During out testing, using the Mesh Intercom severely reduced battery life and only delivered approximately a half mile range (in line-of-sight conditions) from the system which claims 1 – 1.2 miles. Additionally, software issues such as volume surges and a lackluster success rate using voice commands led our ringleader Evans Brasfield to conclude his review with an, “I can’t recommend the Sena 30K,” remark and as someone using and testing the system with him, I agree. Sena’s 30K Bluetooth communicator is available from Amazon and other retailers. The Sena 20S EVO has been on the market for some time now. It has received praise from many. Both Evans and myself have used these systems extensively and continue to view them as a great option for those in the market. With the EVO, Sena has built upon its successful 20S platform with slight physical changes to the unit and an increase in range. The Sena 20S EVO uses Bluetooth 4.1 technology, offers an eight-way intercom with a claimed range of 1.2 miles as well as audio multi-tasking, universal (brand) intercom, some voice commands, and advanced noise control via the ambient microphone. For the a full look at the Sena 20S EVO, check out Brasfield’s comprehensive review here. Sena’s 20S EVO Bluetooth communicator is available from Amazon and other retailers. The Sena SMH10R is Sena’s super slim offering to the market for riders looking for less bulk and a more streamlined Bluetooth communicator. Again, the SMH10R is a time-tested unit that many riders have used over the years. Features include universal intercom, four-way intercom, voice-prompts, Bluetooth music control, multi-tasking with GPS and phone, music control among others. 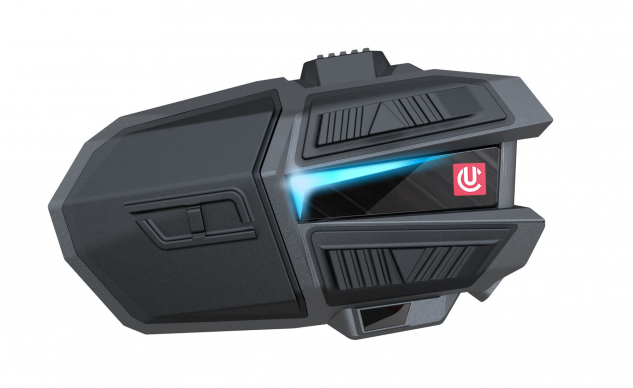 The SMH10R can be used while charging, and similar to the PackTalk Slim from Cardo, the battery on this unit is meant to be positioned on the rear of the helmet with the control buttons on the side. The Sena SMH10R retails for $219.00. Sena’s SMH10R Bluetooth communicator is available from Amazon and other retailers. Of course there’s another option completely should you not feel like installing anything and find yourself in need of a helmet: enter the Sena Momentum Bluetooth integrated helmet. The Sena Momentum uses the same technology of the 20S system and neatly integrates the tech into its proprietary helmet. Most importantly, this allows Sena to really fine-tune they way their communication system interfaces with the user and the helmet. The Momentum works well, but there may still be some tweaking that needs to be done to make this offering viable for everyone. Check out my full review of the helmet for all of the details. The Sena Momentum helmet retails for $449.00. 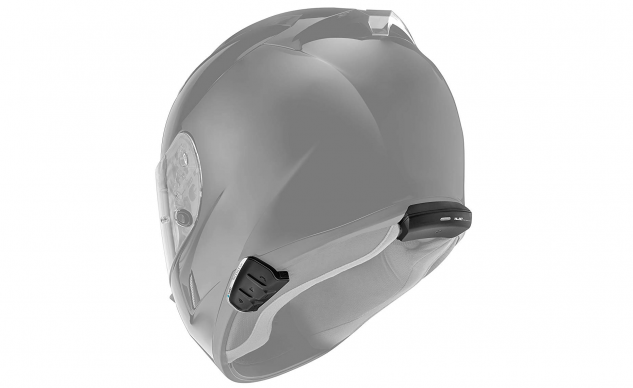 The Sena Momentum Bluetooth-integrated helmet is available from Revzilla and other retailers. 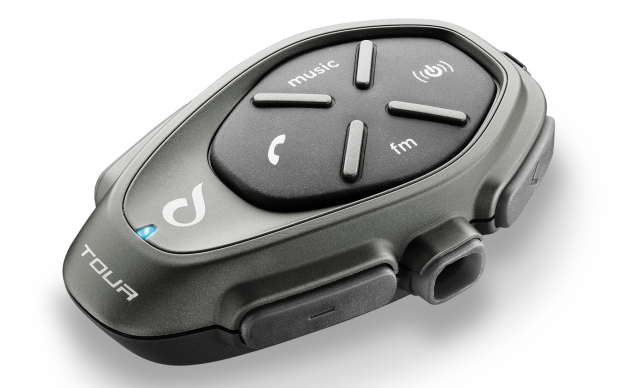 The Cellularline Interphone line may not be as much of a household name for motorcyclists as Sena or Cardo, but the Interphone Tour offers many of the same features found in other units on the market. The Tour model will allow up to four motorcyclists to communicate and is easily paired to any Bluetooth enabled smartphone or GPS for navigation or just listening to music. This unit is completely waterproof (IP67), and Interphone claims the Tour can be quickly charged thanks to its Fast Charge technology. As with other units, the Tour can be used with a few different voice commands, can be paired universally between brands, and allows users to reconnect seamlessly should they be seperated. The Tour has a claimed range of just under one mile and retails for $304.95. The Cellularline Interphone Tour Bluetooth communicator is available from Revzilla and other retailers. UCLEAR’s Motion Infinity is another outlier in the market but packs a substantial list of features into its sharp angular chassis. The Motion Infinity uses Bluetooth 5.0 technology, an on-board accelerometer, its own Dynamesh mesh intercom system, and Gesture Control navigation to bring state-of-the-art technology to the helmet communicator market. The USAFE accelerometer is used to detect and measure hard impacts and, if the rider is unresponsive, can alert emergency services and send GPS coordinates (if the phone is connected). UCLEAR claims its Dynamesh was the first mesh intercom to hit the market and can be connected with mesh and non-mesh devices and auto-reorganizes as the group moves around to maintain connection. Gesture Control uses a sensor beam to allow simple hand gestures to perform basic tasks such as volume control, and pausing and restarting music without the user actually needing to touch the unit, helpful for those riding with thick gloves in cold temperatures. The Motion Infinity also uses the on-board accelerometer to determine when you may have set your helmet down and not turned off the unit, and can shut itself down to save battery life. Other features such as voice command including Siri and Google, universal connecting, private vs group intercom, music sharing and more are included with the Motion Infinity. Range is claimed to be just three quarters of a mile and this unit retails for $274.95. The UCLEAR Motion Infinity Bluetooth communicator is available from Amazon and other retailers. 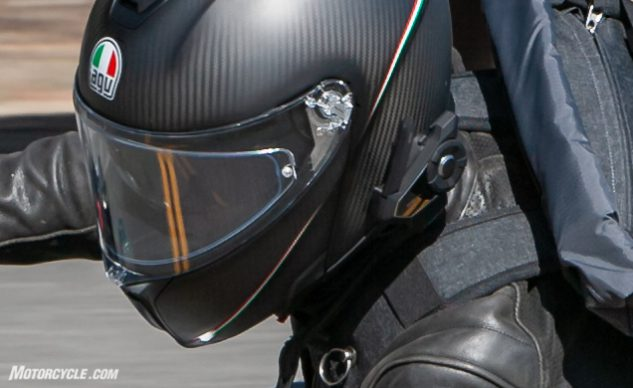 The post Helmet Communicators Buyer’s Guide appeared first on Motorcycle.com.